1 out of 3 indicators were rated as PASS. Water quality indicators for Upper Lemon Bay improved in 2017, but only very slightly and its ratings remained unchanged. While phosphorus concentration remained well below the desired target, chlorophylll and nitrogen levels are still above their regulatory thresholds; mean values for all three water quality measures were slightly lower than the previous year, but overall water quality remains a concern. Water Quality: Chlorophyll a mean concentration in 2017 was 0.0130 mg/l, exceeding the threshold of 0.0089 mg/l. Mean nitrogen concentration decreased to 0.6031 mg/l, remaining above the threshold of 0.560 mg/l. At 0.1261 mg/l, mean phosophorus concentration is well below the target and is again rated as “Excellent”. The mean for chlorophyll a was calculated as an arithmetic mean and the means for nitrogen and phosphorus were calculated as geometric means (per the Numeric Nutrient Criteria outlined in the Florida Administrative Code, section 62-302.532). Biotic Indicator: Measurement of the biotic indicator, seagrass, was performed in 2016 by the Southwest Florida Water Management District. Between 2014 to 2016, seagrass coverage in Lemon Bay (including both the Upper and Lower segments) remained at 3,913 acres, exceeding the combined target value of 3,890 acres. 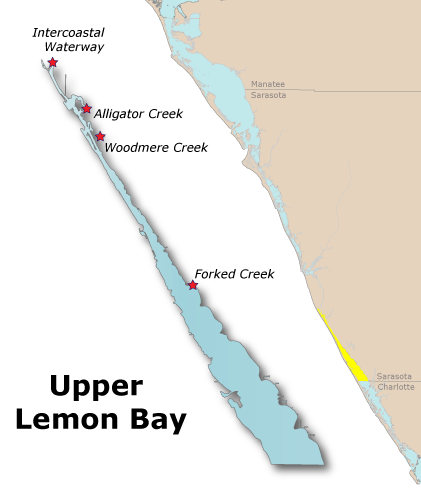 Lower Lemon Bay was not surveyed separately, but has a target level of 1,010 acres. Score: Caution How was this determined? The rating for Total Nitrogen is determined by comparing the annual arithmetic mean of its sampled values to fixed target and threshold values. The annual arithmetic mean is shown in the graph at left, as compared to its established target and threshold values. An arithmetic mean is used for Total Nitrogen for consistency with the Surface Water Quality Standards, Florida Administrative Code 62-302.532, Estuary-Specific Numeric Interpretations of the Narrative Nutrient Criterion. The rating for Total Phosphorus is determined by comparing the annual arithmetic mean of its sampled values to fixed target and threshold values. The annual arithmetic mean is shown in the graph at left, as compared to its established target and threshold values. An arithmetic mean is used for Total Phosphorus for consistency with the Surface Water Quality Standards, Florida Administrative Code 62-302.532, Estuary-Specific Numeric Interpretations of the Narrative Nutrient Criterion.